Welcome to Tomko Dental Associates, your family-friendly dental practice with a high-tech touch, serving patients from Allentown, Breinigsville, and other surrounding communities. We are passionate about two things in our office: patients’ comfort and oral health. Our dentist and team work hard each day to ensure patients are completely at ease from the moment they arrive in our office. We treat people with kindness and consideration, and our knowledgeable team always takes the time to answer questions and make sure patients understand their treatment options. As a dental practice, our goal is to help patients achieve and maintain the healthiest possible smile for their whole lifetime. 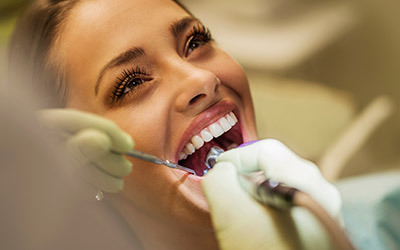 We utilize the latest dental techniques and technologies to ensure patients receive quick, comfortable, convenient, and effective treatment. From the simplest checkup visit to the most advanced dental services, we go above and beyond to make sure patients receive care that exceeds their highest expectations. To find out more, explore our service pages or contact our dedicated Allentown dental team today. At Tomko Dental Associates, we create personalized dental care plans with a focus on prevention. During regular dental checkups and teeth cleanings, we’ll examine your smile for early warning signs of oral health concerns like gum disease, tooth decay, TMJ dysfunction, and oral cancer. Then, we partner with you to create a custom oral health care plan to ensure you achieve and maintain your optimal level of oral health. Repairing damaged teeth right away is essential to ensure you can receive a conservative treatment. The longer your tooth remains damaged, the more severe the oral health concern becomes. Our team works hard to help patients maintain their healthiest smiles, but when you do not to repair dental damage, we can provide a wide range of restorative solutions including fillings, dental crowns, and dentures. A flawless smile can improve your confidence in personal and professional interactions, but very few people are actually born with a gorgeous smile. Instead, we can help you create the picture-perfect smile of your dreams with a personalized cosmetic dentistry plan that can utilize any number of treatments, including teeth whitening, porcelain veneers, and Invisalign. Explore our advanced dental technologies to find out how we use them to make your dental care experience safer and more comfortable during every dental appointment. We use a wide range of dental technologies to ensure we always provide precisely planned dental treatments that can be performed in complete comfort. We can use dental implants to support any number of replacement teeth forming natural looking, feeling, and functioning smiles. We can use implant posts to support a single dental crown, fixed bridge, partials, and full dentures. Implant retained tooth replacement prosthetics look, feel, and function more like your healthy smile. If you are one of the millions of US adults who experience dental phobia or anxiety, it may be time to consider visiting our office for relaxation dentistry. Our team offers dental sedation using nitrous oxide. Using nitrous oxide, we can help patients who have severe dental anxiety and for those who need advanced or complex dental treatments in fewer appointments. Dental emergencies can strike out of nowhere and turn a regular afternoon into a painful evening. Don’t waste time and money visiting an emergency room for urgent dental treatment. Instead, call the experts at Tomko Dental Associates. We’re here to relieve pain and get started renewing oral health right away after a dental emergency. Gum disease affects more than 50% of adults in the US, and this oral health condition can lead to numerous concerns including tooth loss. Our team offers a wide range of periodontal therapies to renew oral health for gum disease sufferers and help patients maintain their healthiest smiles. If you experience chronic snoring, excessive daytime sleepiness, or difficulty concentrating, you may be suffering from a sleep disorder called sleep apnea. This disorder occurs when patients cease breathing for ten or more seconds at a time during sleep. While most people experience some apnea events each night, patients with sleep apnea can have these apnea events 100s of times. Our dentist can create customized oral appliances to help you sleep soundly and breathe deeply during sleep.